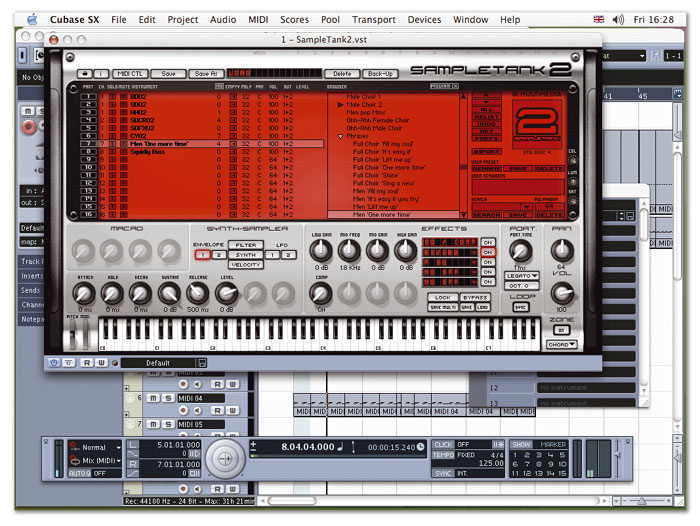 IK's Sampletank 2 running under Steinberg's Cubase SX2. Sampletank was a hit — a sample-based virtual instrument with great sounds and, at the time, not much competition. Two years on, there are plenty of fully featured software samplers and non-sampling virtual instruments too. Can Sampletank 2 keep up? Sequels are usually bigger and more expensive than the original, but as anyone who's sat though Blues Brothers 2000 will know, they aren't always better. 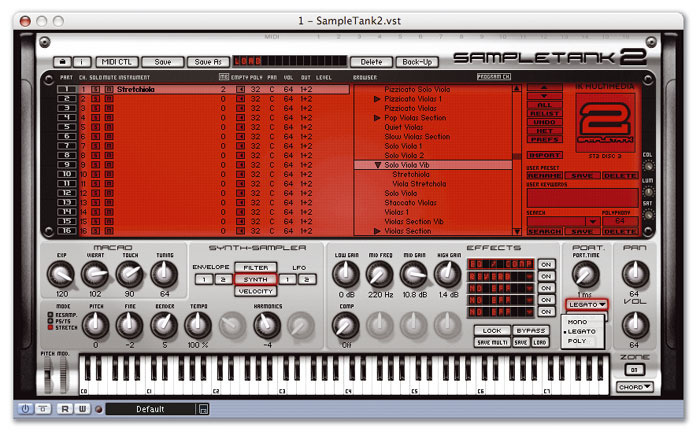 I've been a fan of IK Multimedia's Sampletank virtual sound module since I first reviewed it in SOS August 2001, and it's still my first port of call for bread-and-butter sounds, especially drum kits and electric basses; but more than two years on, it's now been replaced by Sampletank 2, which IK have been heralding with much ado for a while now. The replacement is certainly bigger, adding a further 2GB of sound data to Sampletank 1's existing 2.5GB library, but that's only the start: it also adds an impressive array of new features, new effects and a thoroughly revised interface, plus support for Mac OS X. So is this sequel like The Godfather 2, or are we talking more Police Academy 7? There are now only two versions of Sampletank, L and XL; the previous dance-oriented DJ version has fallen by the wayside, although the new Sampletank 2 is actually much better equipped for working with loops. The plug-in now supports Audio Units, VST, Direct X, MAS (Mac OS 9 only) and RTAS/HTDM formats. On the Mac, you'll need Mac OS 8.6 or above, while Sampletank 2 will run under any flavour of Windows from 98SE to XP (or 95 to XP, if you believe the manual rather than the spec on the outside of the box). A G4 or Pentium 4 processor with 512MB of RAM is recommended, and 4.5GB of disk space is required. Sampletank L and XL come on CD-ROM, with the sample library supplied separately on four or eight CDs respectively. Each of the eight CDs in the XL version I tested requires you to choose what elements you want to install and accept a licence agreement, so you need to be present and awake throughout the installation procedure, which took around 45 minutes on my machine. Given that the program requires a reasonably up-to-date computer to run, it might have been better to supply the sample library on DVD-ROM. Having installed the version on the CD, I found that this didn't seem to work with Mac OS 10.3 (Panther), but downloading an update from IK's web site soon got things going, and a further update was made available as I was finishing the review. Once installed, you need to authorise the plug-in in the usual challenge-and-response style; until you do so, Sampletank 2 will run in demo mode, with polyphony limited to four notes. The built-in parametric EQ. The Preamp, Tone, and Cabinet options form the basis of IK's guitar amp-modelling software Amplitube, and are welcome in Sampletank 2. 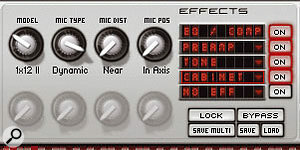 One of the best features of the original Sampletank was the bundled effects. Most of the factory organ patches, for instance, used IK's distortion and rotary-speaker emulations rather than sampling these factors at source, and they sounded great. All the version 1 effects are present and correct in version 2, and they've been joined by some powerful new algorithms. Perhaps best of all is the inclusion of three modules called Preamp, Tone Control and Cabinet, which, in their stand-alone plug-in guise, form the core of IK's Amplitube amp modeller. Amplitube is the best software amp modeller I've used — to my mind it's clearly superior to both Line 6's Amp Farm and also hardware units such as the Johnson J-Station — and these three effect modules allow you to impose exactly the same sound-shaping on Sampletank sounds. IK have also mined their T-Racks mastering processor to provide a new parametric EQ (shown above), a punchy compressor with a stereo enhancer, and a limiter. Further new additions include a lush 12-stage phaser, a bit-crusher, a convincing spring reverb and the intriguing multi filter. This combines low-pass, high-pass, band-pass and notch filters with independent level controls, but the same cutoff and resonance settings. The interaction of the controls isn't explained in the manual, but the filter offers some unusual sound-shaping possibilities. Wherever it makes sense to link an effect to tempo you can do so, and you can now also save multi-effects setups independently of Sampletank patches, which provides a quick way of applying one patch's effects settings to another patch — or at least it would do, except that trying to load an effects multi on my system caused Sampletank and Cubase SX to expire gracefully. Perhaps the most fundamental changes to Sampletank have to do with the synthesis methods used to play back sounds. There are now three different sample-playback engines, each of which is appropriate to different kinds of program. Conventional sample playback, which simply plays back samples faster or slower to change their pitch, is still the most appropriate for multisampled instruments such as pianos. To this, IK have now added a real-time pitch- and time-stretching mode, which allows you to play back loops at different pitches without affecting their tempo, or change their length without altering the pitch. However, the addition they've made the most fuss about is their new 'Stretch' engine. Similar in some ways to Roland's Variphrase technology, this includes both real-time formant-corrected pitch- and tempo-shifting, but adds control over the harmonic content of the sound, permitting individual samples to be played back over a wide range without the 'chipmunking' and other artifacts that conventional pitch-shifting produce. There's much more user control available in version 2, as well, with the likes of pitch, amplitude and filter envelopes accessible for easy tweaking, and every Sampletank 2 parameter can be controlled via MIDI. Loops can be tempo-sync'ed with the Sync button (right). The Tempo and Overlap buttons then appear (left). IK Multimedia have added new samples and patches to Sampletank's own library, but perhaps more importantly, they've taken steps to make it more useable as a general-purpose sample-playback synth. 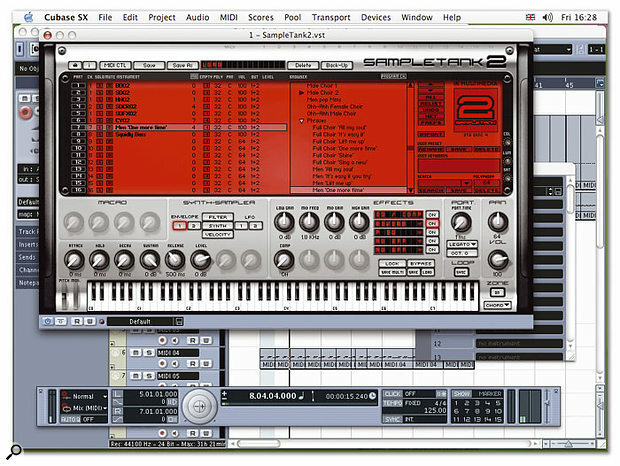 Originally, Sampletank L and DJ had no sample-import capability at all, while the XL version came with a separate utility for importing Akai-format sample libraries which was unfriendly and prone to crashing. In version 2, both Sampletank L and Sampletank XL boast built-in features for importing WAV, AIFF and SDII samples, Akai S1000/S3000 samples and Programs and, on the Mac version only, Samplecell instruments. Elsewhere, the excellent effects supplied with version 1 have been boosted by a number of new ones, including many of the 'building blocks' that make up IK's superb Amplitube amp simulator and their T-Racks mastering suite (see the 'New Effects' box above). You can now have up to five effects per patch, if you count the EQ and compression module fixed into the first 'slot', and the effects themselves offer greater control. There are also numerous other minor improvements, as we'll see. Existing Sampletank users will notice that the plug-in window is quite different in version 2. The red, black and grey colour scheme is still present and correct (though the red can now be changed for a variety of other lurid colours), but the window itself is larger, and packs in a lot more information. One welcome development is that the main screen now shows what patches are loaded in all of the 16 'slots' that are available, and allows you to adjust basic parameters such as polyphony, volume and output routing for any of them without having to select that slot for editing. You can also choose how many output channels each instance of Sampletank should have, and save and load complete Sampletank setups as presets. Programs are loaded using the sample browser, which has been updated to allow you to see multiple levels at once, and now resembles the 'List' view in the Mac OS 9 Finder. As before, Sampletank 2 patches can include keywords, and there's a Search function which works on these — or doesn't work, at present, since searching on a valid keyword always caused both Sampletank and Cubase SX2 to quit unexpectedly in my system (IK are aware of this problem — it is apparently a Sampletank-specific bug, so it will affect you if you run the instrument under other sequencers too — and claim to be working on a fix for it, though none was available before this review went to press). An eight-octave mini-keyboard has been added at the bottom of the Sampletank window, and is used to audition and edit patches. Where Sampletank 1 provided control over a maximum of four parameters per patch, its successor offers much more flexibility, with seven pages of controls available for editing at the bottom left of the screen. Navigating around Sampletank's built-in sound library is still very straightforward. It's divided into the same categories as it always was, and all the version 1 sounds are present and correct, but each folder also boasts a healthy complement of new patches. In the areas where Sampletank was already strong, the new presets generally maintain the quality level. For instance, the highlight of version 1 for me was its excellent drum kits, and there are some new ones here that are equally good (although it seems odd that some of the new ones are mapped an octave higher on the keyboard than the existing kits). There are also some very good new basses, and the additions to the Organ folder keep up the high standards. Elsewhere in the 'bread-and-butter' department, there are some welcome new acoustic and electric pianos, even more percussion, including the likes of celeste, vibes and xylophones, and a lot of new guitar patches — although sadly I couldn't find the promised pedal steel anywhere. There are lots of new synth patches, many of them very useable, and there are more sounds in every department of the orchestra, although many are simple alternatives to existing ones, like the additional solo violas and violins. Quality-wise, most of the new orchestral sounds are comparable to the better ones in Sampletank 1, which is to say that they're pretty ordinary, with the woodwinds probably benefiting the most from the overhaul. Not all the new names in the preset list involve additions to the core sample library. Many of the 'new' kits, for instance, are actually variations on the same sets of drum sounds, and are made to sound different by creative use of effects. Where version 1 had a single kit called 'Comp Vintage', that heading in the new version is now the name of a folder containing 11 variants, all scuffed up in interesting ways using distortion, bit-crushing, amp simulation and the like. The resulting kits are mostly very useable, but it wouldn't be hard to achieve the same results yourself, and I'd rather IK had put their effort into sampling some more raw drum sounds — there are perhaps 80 or 90 new acoustic drum kit patches, but nothing like that many new sets of kit samples. Elsewhere, IK have put a lot of work into the Vocals section, but with rather less impressive results. This now provides an extensive array of choral 'ooh's, 'aah's and 'mmm's, plus a choice of male, female or mixed choirs singing uplifting phrases like 'It's easy if you try'. All of them are well recorded, but the latter are every bit as cheesy and pointless as they sound, and I can't help wishing that IK had just sampled another half-dozen drum kits instead. You could browse through nearly all of the above-mentioned categories without encountering IK's new pitch-shifting/time-stretching and Stretch technologies at all. In fact I couldn't find a single patch anywhere in the factory sound set that used the PS/TS playback engine by default. It's clearly intended for use with sampled loops, and sure enough, loading one of the programs from the Loops folder and selecting PS/TS as the synthesis engine allows its constituent loops to be sped up or slowed down by a fair amount without any change in pitch, and without incurring noticeable side-effects. The selection of dance-styled loop 'construction kits' from version 1 has been joined by a decent range of percussion loops in version 2, and where Sampletank knows the tempo of a loop (more on this somewhat cumbersome procedure later), you can sync it to that of the host sequencer, both in normal sample-playback mode (in which case the pitch varies with tempo) and using the PS/TS engine. Time-stretching and pitch-shifting processes are never perfect, but the quality of the latter is a lot better in Sampletank 2 than, say, the off-line time-stretching effect in Cubase SX. Stretch, by contrast, is designed for monophonic pitched sounds, and within the factory set it seems to be deployed mainly in the solo orchestral instruments. The orchestral sounds were probably the weakest aspect of the original Sampletank, with too much emphasis given to useless ensemble patches, and many of the solo instruments suffering from obvious multisample split points, or just sounding plain bad. Rather than improve the solo instruments through exhaustive multisampling and velocity layering, or offering the kind of sample-streaming technology pioneered by Nemesys/Tascam, IK seem to be banking on their Stretch technology to generate realistic, playable solo instruments from relatively few samples. 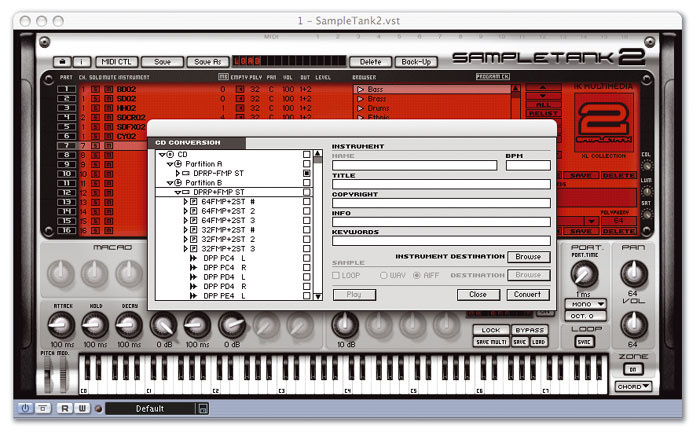 When you load in a Stretched program, or select Stretch as the synthesis engine on any other program, Sampletank 2 takes a second or two to perform 'Preanalysis', after which the program is presented just like any other patch. Even before you start altering a sound's harmonic content or pitch range, this initial process has an audible effect, and if you feed the algorithm something really unsuitable — such as a drum loop — you can generate all manner of weirdness. 'Stretching' a viola — note the Harmonics control. The good news is that with the right samples, such as certain solo instruments, Stretch does a good job of eliminating 'chipmunking', aliasing, and the other side-effects that creep in when you normally play a single sample over a wide range. Any modulation in the sample doesn't change speed as you move up and down the keyboard, and you can use the Tempo knob to speed up or slow down vibrato and tremolo independently of pitch. This also means that Stretch can be used to play back a phrase sample at different pitches with a constant tempo. Better still, if you set the sample to Legato mode and play legato notes on a MIDI keyboard, you can impose a new melody on an existing phrase while it plays back, while keeping the original timing. The bad news is that taking a few samples of a solo instrument and Stretching them is still no substitute for multisampling an instrument properly in the first place. For one thing, there's the side-effects of the initial preanalysis process, which are usually audible even when playing back a sample at its root pitch, although they're not always unpleasant. For another, applying Stretch to a multisampled patch doesn't disguise any obvious discontinuities in the multisamples, so you still get those jarring changes in timbre as you move from one zone to the next. Finally, the RAM-saving benefits of using fewer samples are easily outweighed by the additional CPU overhead of the Stretch engine. On the 700MHz G4 iMac I was using to test it, every sustained note in a Stretched patch caused Cubase's CPU meter to jump by between 10 and 20 percent depending on settings, while the initial attack phase of each note seemed to require much more, and I could often only achieve two or three-note polyphony before note attacks began to glitch. By contrast, each note of polyphony in a standard sample-playback patch used around two or three percent of the computer's CPU resources. Perhaps the most interesting, and potentially useful, aspect of Stretch is the Harmonics control, which allows you to make radical changes to the timbre of a Stretched sound. This has a range from -24 to +24, with negative values making the sound darker, and positive values making it brighter. The effect is quite unlike EQ, in that it follows the pitch of each note, and seems to bring out or suppress the natural characteristics of an instrument, as though the harmonics present in the sound are being boosted. In the factory sounds, for instance, I found that lowering the Harmonics value did a lot to tame the harshess and scratchiness of the solo strings, and brought out a pleasant woodiness in the sound. You can achieve some very interesting effects by automating this control, though doing so seems to load the CPU even further. Overall, Stretch is a clever technology which does offer some interesting sonic possibilities, but if its main aim is to rescue Sampletank's orchestral instruments from mediocrity, I have to say it doesn't fully succeed. The orchestral sounds do show definite areas of improvement in version 2, and Stretch certainly makes the solo instruments more versatile, but I still feel that anyone serious about composing for the virtual orchestra will want to investigate dedicated sample libraries instead. As luck would have it, Sampletank 2 landed on my desk the same day as Hypersonic, Steinberg/Wizoo's take on the virtual sound module. You can read a full review of Hypersonic elsewhere in this issue, but I thought it would be interesting to draw a few comparisons between the two. Hypersonic's highly data-compressed sample banks total less than 300MB, compared to Sampletank XL's 4.5GB, but don't let that fool you into thinking that the former can't provide serious competition. Hypersonic covers almost exactly the same range of sounds and provides a wealth of punchy basses, some cool organ patches, a selection of very useable drum kits and percussion sounds, bags of synth leads and pads, and much more besides. Like Sampletank 's, Hypersonic's patches present a basic selection of editable parameters that are chosen by the sound designer, and also allow you to go 'behind the scenes' for more in-depth editing. Hypersonic shows a different direction IK could have gone with Sampletank 2: where IK have moved into soft-sampler territory, Steinberg and Wizoo have concentrated on building up the synthesis side of things. Hypersonic doesn't offer the option of loading in your own wave files or importing sample CDs, or an equivalent of Stretch, but it does provide virtual-analogue, FM and wavetable synthesis engines, as well as sample-based patches. And just as Sampletank 2's sampling features are limited by comparison with a true software sampler, so Hypersonic doesn't offer the same freedom to create and edit synth patches as you'd find in, say, Reaktor. However, I'm inclined to think that that's less of a problem; even though the synth architecture is restrictive, it's still easy to tailor the synth sounds in Hypersonic, whereas creating your own sample libraries in Sampletank is not. On practical grounds, Hypersonic's dongle protection might cause some hassle, but its faster patch loading and lower CPU load are big pluses compared to Sampletank. In terms of factory sounds, there's surprisingly little to choose between the two, and in fact, they share many of the same strengths and weaknesses. For example, with a few exceptions, I doubt that anyone would want to do serious work with Hypersonic's orchestral sounds. Again, too many of them are cheesy ensemble patches, and though a few of the solo instruments sound good, there are still plenty of obvious multisampling joints on display, and no solo strings at all. It's a score draw on most of the keyboard instruments: on the organ front, Sampletank's distortion is sweeter, but Hypersonic has a neat Leslie speed change; both offer acceptable electric pianos; and while Hypersonic's grand pianos are grander than Sampletank 's, they won't necessarily be more useable in a mix. Hypersonic wins hands down on a few instruments, including nylon-strung guitar, marimba and vibes, and on actually having a Clavinet! However, most of Sampletank's percussion is better, and although Hypersonic's drum kits seem to use more velocity layers, Sampletank's sound more real and offer more variety (Hypersonic doesn't even have a brushed kit). Unsurprisingly, thanks to its variety of synth engines, Hypersonic is a better choice for synth sounds. In general, Hypersonic reminded me slightly of recent Roland S&S synths like the XV series: most of the instruments have an immediate appeal, with a very big, in-your-face sound, but they also tend to have a slightly compressed, 'cartoon-like' quality, and often rely on tons of reverb, delay or EQ to make them sound more impressive. Sampletank, by contrast, lacks some of the same directness, but often seems to offer a more natural sound, with less obvious looping in the samples. With the original version of Sampletank, importing additional sample libraries was a theoretical possibility — provided they were in Akai format — but rarely worked well enough to be worth the effort, so if you did want to augment the factory sounds, you had to splash out on a 'proper' software sampler like Halion or EXS24. 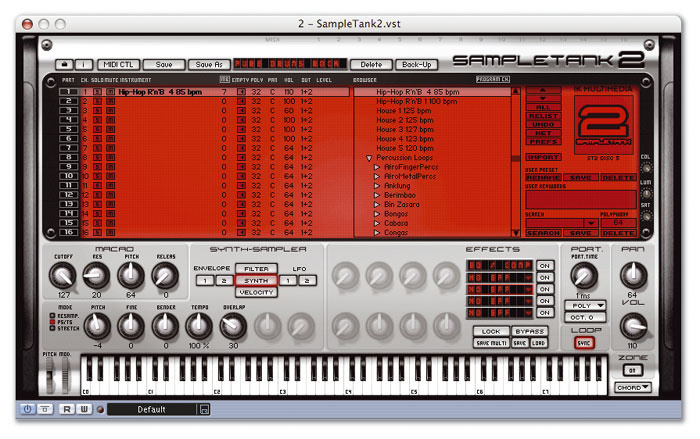 IK clearly recognised that the Sampletank Converter utility supplied with version 1 had its shortcomings, and a new set of import features has been included in version 2. This time they're built into the plug-in, and allow you to import a range of sample formats including Akai S1000/S3000, WAV, AIFF and Sound Designer II, at sample rates up to 96kHz and bit depths up to 24. The Mac version is also being endorsed by Digidesign as an upgrade path for users of the now-defunct Samplecell and Soft Samplecell systems, and can import this format too. Importing from an Akai disc is now impressively easy. You click the Import button and are prompted to insert your CD-ROM. After a few seconds' chuntering, Sampletank displays its directory structure as a tree list, and you can choose which elements you wish to install, whether that's the whole CD or individual volumes, programs or samples. Once you've selected a destination folder and added any search keywords you feel might be useful, Sampletank then churns away and imports your chosen selection, before updating the browser list to reflect the new additions. I tested the import facilities using a couple of Akai CD-ROMs, and found that Sampletank 2 had no difficulty importing the programs and mapping the individual samples to the correct keys and velocity layers. This is good, because there's no way to change these settings if Sampletank gets them wrong! The import procedure seems to ignore any MIDI channel information within the programs, so where you have a volume with multiple programs that are designed to be loaded all at once and on the same MIDI channel, these become separate patches within Sampletank, which have to be loaded to different Sampletank 'slots'. In many cases this makes sense, for example where you have a drum kit stored as a volume with multisampled kicks, snares, hi-hats and so on saved as separate programs within it. Each of these instruments then has to be loaded into a separate Sampletank 'slot', but it's easy enough to have multiple slots respond on the same MIDI channel, so you can still play the whole kit from a keyboard, and you then have the advantage that each instrument within the kit can have different effects, levels, output settings and so on. In other cases, it would be nice to have the option to treat an entire Akai volume as a single Sampletank Program so that you don't, for instance, end up having to load different bits of a multisampled piano into different slots. In either case, a big plus is that it's now possible to save and recall complete Sampletank setups, with different programs loaded on different slots, so you only need to go through the hassle of setting up your drum kit or piano once. Creating your own programs by importing WAV, AIFF or SDII files is also possible, but the procedure is rather less elegant. Sampletank can recognise root note information stored as part of the WAV or AIFF 'data chunk', or it can create key and velocity splits based on information supplied in file names. In this case, it's up to you to work out in advance how you want your samples spread across the keyboard and the velocity range, and to name them accordingly by including codes such as 'c3' for root note and 'v65' for maximum velocity. You also have to use the file name to pass on loop tempo information to Sampletank. Then, if you have the relevant options selected when you import the samples, Sampletank should map them across the keyboard in a suitable fashion. This, to be blunt, is a bit of a stone-age method of creating multisample programs, and hardly lends itself to fine-tuning. Probably the best thing you can say about it is that it works. 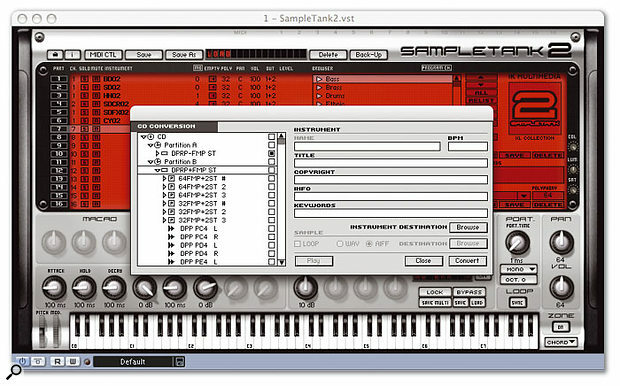 If you make a mistake, or if you need to tweak the mapping at a later stage, you'll need to sort things out by modifying the file names and re-importing the sounds — Sampletank doesn't include any facilities for editing the mapping of an existing program, though clicking the Zone button shows you the distribution of samples across the keyboard. The second of the built-in AHDSR envelopes. One of the two highly controllable built-in LFOs. Velocity can be mapped to a variety of modulation options. Sampletank 2's sample-import functions are probably best thought of as a useful bonus, rather than to provide serious competition for fully fledged software samplers. They're useable if you just want to add the odd sample to the library, or import a recording to muck about with the Stretch function, but they don't compare to the advanced sample-editing and mapping tools supplied with a program like Bitheadz' Unity Session. I also found that in Mac OS X, Sampletank 2 failed to recognise any of the WAV files I pointed it at. Once you've got your samples loaded and mapped, or decided which set of factory samples you want to tweak, you can choose which of the three playback engines you want to use, and set up the various parameters to your satisfaction. All three synth engines give you coarse and fine pitch controls, and allow you to modify the pitch-bend range; Stretch adds the Tempo and Harmonics controls mentioned earlier, while the PS/TS engine provides Tempo and Overlap controls. The former can be varied over a huge range (10 to 1000 percent of the sample's original tempo), while the latter sets what IK rather cryptically describe as the "amount of data that's mixed between the time-stretcher grains". It appears to have only a very subtle effect in most cases, anyway! Whichever synthesis engine you adopt, your program also benefits from two ADSR envelopes — one hard-wired to amplitude, the other to filter cutoff and pitch — and two LFOs, each of which can be assigned to amplitude, pitch or filter cutoff. LFO2 can also be assigned to pan, while LFO1 boasts a delay parameter and the ability to run continuously rather than be triggered anew with each key-press. Keyboard velocity can be used to modulate amplitude, filter cutoff and resonance, pitch, LFO1 depth and Env2 sustain, while the filter offers low-, high- and band-pass modes with 6, 12 or 24dB-per-octave slopes. I was slightly surprised to find that there's no key-follow parameter for the filter cutoff, but this aside, Sampletank 2 provides all the control most users are likely to need. If you're used to the simplicity of Sampletank 1 and find all this control a bit overwhelming, you can always restrict your tweaking to the four Macro knobs, which have been retained in version 2. These control up to four parameters considered the most important by the designer of each sound, whether that's the velocity response and brightness on a bass guitar, the attack and release times on a sitar, or the relative levels of the kick, snare, hi-hat and other instruments within a drum kit. For imported sounds, the four Macro knobs default to Attack, Release, Cutoff and Tuning, and there's no way to reassign them. In the original version of Sampletank, the Akai import utility often crashed, but the plug-in itself was rock-solid. With version 2, by contrast, the import facilities seem stable, but in general use I found that my reviewing combination of Cubase SX2 and Sampletank 2 under Mac OS 10.3 fell over regularly. In some cases, I'm sure the fault lay with Cubase, but Sampletank did seem to have its flaky side as well, and there were some actions that produced repeatable crashes. For instance, attempting to delete a Sampletank instrument using the Delete button produced a message telling me that I could only do so by manually moving the samples into the Trash — and if I did this without closing Sampletank first, it always caused Cubase to quit 'unexpectedly'. As mentioned earlier, searching on a valid keyword in Sampletank's browser had the same result, as did trying to load an effects multi. To be fair to IK and Steinberg, I was testing Sampletank 2 under the first release of Panther, which has thrown up problems with other applications that were stable under OS 10.2, and I strongly suspect that Windows and Mac OS 9 users won't experience the same level of instability. Since I installed version 1 of Sampletank, more than two years ago, I've used it more than any other virtual instrument, and it would be fair to say that I was looking forward to trying out version 2. Having done so, it's hard not to be impressed by the huge amount of work that IK have put into the new release. This is not simply an evolutionary upgrade, with a few new bells and whistles and a fresh coat of virtual paint: it is, in many respects, an entirely new instrument. That said, the question arises as to how well IK's efforts have been directed. Version 1 of Sampletank had a clearly defined purpose: it provided a great-sounding, idiot-proof collection of bread-and-butter sounds, and the means to get them into your sequencer quickly and with a minimum of fuss. If you wanted to get your hands dirty creating your own sample libraries, messing around with keyboard split points or experimenting with morphing filters, it clearly wasn't the product for you. Background colours may be changed from red, although it's not necessarily an improvement! With version 2, on the other hand, I get the impression that Sampletank is trying to be all things to all people. 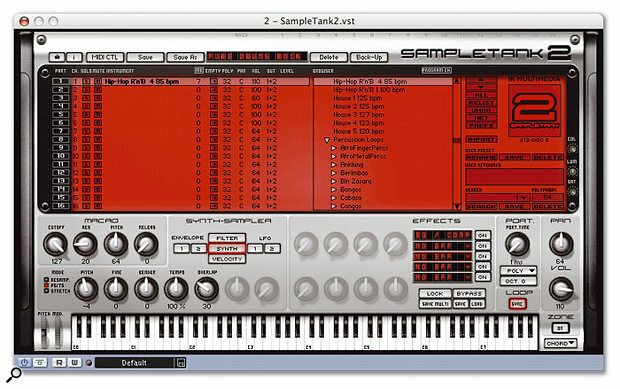 Many of the changes do represent genuine forward movement: the integrated Akai-import facilities and the new features for manipulating the pitch and tempo of loops, for example, really extend the scope of Sampletank as a product, while IK have managed to make many more parameters available for hands-on editing and MIDI control in version 2, without sacrificing its ease of use. The new browser is a definite plus, as is the ability to see and control all 16 slots at once, and the new effects maintain the excellent standard set by those supplied in version 1. Finally, features such as the ability to save entire Sampletank setups and effects multis, and to set multiple slots to respond on a single MIDI channel, make a definite difference to the useability of the program. However, the problem with Sampletank 2's wider scope is that its new features bring it into the realm of 'proper' software samplers such as Halion, EXS24, Unity Session and Kontakt — and at present, it can only suffer by comparison with these programs. Of course, the increased flexibility compared to version 1 is welcome, as is the ability to create your own patches from WAV or AIFF files, but Sampletank's functionality in this department is still very basic. There's no proper way to edit key or velocity mapping (other than by editing filenames, which hardly counts in this day and age), no sample editor, and no option to import from other soft-sampler file formats. Perhaps more seriously, Sampletank still can't stream samples from hard disk, so all those massive Giga-format libraries will remain out of reach for the foreseeable future. Similarly, the facilities for manipulating loops look great when compared to version 1 of Sampletank, but not quite so hot when compared to a dedicated product like Bitshift's Phatmatik Pro. Elsewhere, the new Stretch algorithm suggests that IK are aiming for some of the sound-bending appeal of Celemony's Melodyne or Roland's Variphrase processors, but again, Sampletank's facilities don't really bear comparison with these dedicated products. There's no doubt that Stretch is a very clever piece of programming, but it places a heavy burden on the computer's CPU, and to my mind, the real-world uses of this technology in a sample-playback synth are limited. If you want to use it on your own recorded sounds, you'll need to save them from your sequencer as WAV files and import them into Sampletank, which is tedious — this sort of resynthesis would be more useful in a stand-alone plug-in or a separate application like Melodyne — and while it can make solo instrument samples playable over a wider range, it doesn't compensate for the deficiencies of the orchestral library. 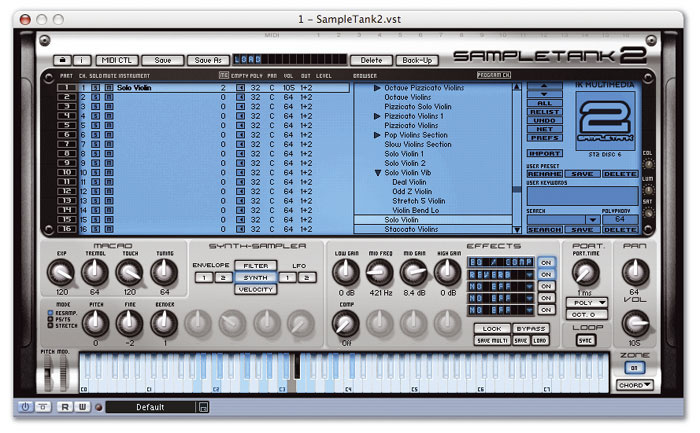 The built-in filter looks simple, but offers low-, high, and band-pass types, plus a choice of 6, 12, or 24dB-per-octave roll-off slopes.In short, the new functions do make Sampletank 2 a better and more versatile means of playing back samples than version 1, but they wouldn't make a serious samplist choose it over EXS24 or Gigastudio. At root, it's still the samples themselves that will determine whether Sampletank 2 flies off the shelves or gathers dust on them. There's nowhere else you can get the factory sounds, they're still presented in a very convenient format, new instruments and programs have been added in version 2, and in its strong areas — drums, basses, organs, percussion and so on — it still offers some of the best sounds around. Yet there is now more competition out there than was the case two years ago; and while Sampletank XL 2's 4.5GB library is almost double the size of the original, the library as a whole is not twice as good. The orchestral sounds show signs of improvement, for instance, but I still wouldn't use the solo strings in any kind of exposed role, Stretched or not. Those who already use Sampletank 1 will have to decide whether to upgrade, bearing in mind that moving to version 2 is the only way to get Sampletank working under Mac OS X; and since all upgrades cost the same and give you the full XL version, users of the old L and DJ versions actually get a better deal than existing XL users. To my mind, the additions to the sample library alone aren't enough to justify the extra £200 to move from XL1 to XL2, so it really depends how much you value the new features. These probably do justify the move for anyone who relies solely on Sampletank, but those who already use it in conjunction with another software sampler might be tempted to stick with version 1. As sequels go, Sampletank 2 is The Matrix Reloaded of virtual instruments: a sprawling epic that's big on ambition and ideas, but not always successful at realising them. If what you're after is a suite of ultra-realistic orchestral sounds, a selection of radical sample-mangling tools, the ability to freely mix, match and manipulate sampled loops, or a flexible and powerful utility for creating your own sample banks in software, there are other products for each of these applications that will suit you better. If, on the other hand, the main item on your shopping list is a high-quality collection of essential rock and pop sounds which can easily be accessed from your sequencer, Sampletank remains a strong contender. The sound library is still its main selling point, and for those who are convinced by the Sampletank sounds, the new features in version 2 can only be a bonus. If you also have a few old Akai discs knocking around, or you fancy the idea of spinning the odd loop into your productions, so much the better. Still offers a good selection of bread-and-butter sounds for rock and pop. Now imports Akai discs easily and elegantly. Users can create their own programs from WAV, AIFF and SDII files. Much more useful than version 1 for working with loops. Many more sound-shaping possibilities available. User interface has been improved in many worthwhile ways. New effects are even better than the originals. There are still some second-rate sounds, especially in the orchestral department. Cannot stream samples from disk, or import Giga, Halion or EXS24 formats. No proper way of editing sample mapping. Not as good as a 'proper' software sampler for creating your own sample programs. The Stretch algorithm is fun, but takes a lot of CPU horsepower and has limited uses. Some stability problems under Mac OS X. Despite a wealth of new sampling-related functions, Sampletank 2 won't replace dedicated software samplers like Gigastudio or EXS24, and it's now got some serious rivals in the 'virtual sound module' arena. Nevertheless, the new features add a welcome flexibility, and if you're after a one-stop shop for rock and pop sounds, you ignore it at your cost. Sampletank 2 XL £399; Sampletank 2 L £239; upgrade from any full version of Sampletank 1 to Sampletank 2 XL £199; upgrade from Sampletank LE/SE/OEM versions to Sampletank 2 XL £279. Prices include VAT.